For those members living in Belgium and Holland, who haven’t had the opportunity to see the latest TV adaptation of Wuthering heights, Flemish broadcaster 'één' will show the premiere of the ITV version, shown earlier this year in the UK, this Saturday evening. The film is split into two parts, part 1 this Saturday, 23 May ,starting 21:15, part 2 next week, Saturday 30 May. It has Dutch subtitles though. At the recent Brontë weekend on 24-26 April, last year’s cemetery excursion was repeated on the afternoon of Friday 24 April. We set off in glorious weather to search once more for the gravestones of Martha Taylor and Julia Wheelwright, friends of the Brontës during their time in Brussels, who were originally buried in the Protestant cemetery which was closed down at the end of the 19th century. We first went to the place of the former Protestant cemetery, quite often visited by Charlotte in her lonely year in Brussels, 1843. 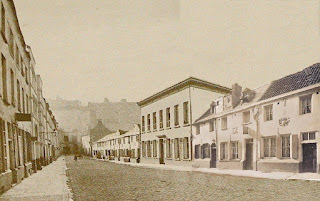 The site of the Protestant part of the cemetery is only partly occupied by a building, so one does not need that much imagination to go back in time to when the cemetery still existed, especially with the assistance of Theodor Wolfe's 1885 eyewitness account. On the group's left side is the site of the Protestant part of the former cemetery. 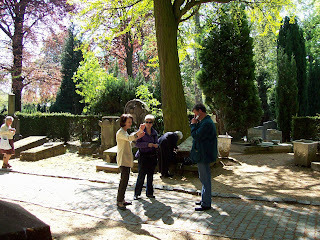 We then went to Evere cemetery to search for the gravestones of the two girls. It was amazing to see how quickly these stones we had cleared last October had become overgrown again, particularly with moss. We searched again in Lane 15, and this time also in Lane 14, but without success. It seems that in these lanes only concession-holders lie buried. What happened to those without a concession, like Martha and Julia, remains a mystery. This time we also had a walk in another part of the very large and indeed quite beautiful cemetery, which also gave us the opportunity to see the Waterloo Monument. British soldiers who fell at Waterloo were first buried at our former cemetery. Lane 15 has one Waterloo grave, quite well kept, and still regularly honoured it seems. Our member Catherine Koeckx has sent this poem in French and two watercolours inspired by the moors around Haworth, which she has visited. Catherine writes "I've always been fascinated by the Brontës' lives and world and I feel closest to Emily as a personality. I also very much like the kind of nature she loved, harsh and wild; it inspires my poetry and paintings." As a member of the "Cercle littéraire" of European Commission staff in Brussels, in 2006 she published a collection of poems entitled "L'Impalpable". 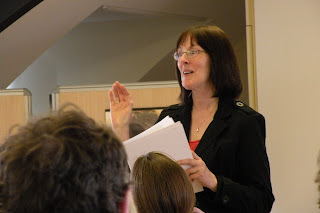 Emily Smith, who attended the talks given by Stevie Davies and Philip Riley during our recent Brontë weekend, has provided the following summary of them. 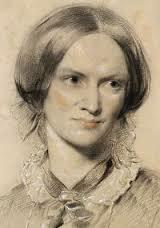 “Earth” is a favourite word for Emily Brontë. Not only, famously, the last word in Wuthering Heights (“...the sleepers in that quiet earth”), it occurs again and again throughout her writings. A speech given at the 2009 Brussels Brontë Weekend, by novelist and critic Stevie Davies, covered a broad and inspirational range of subjects, all centred around the idea of earth. Mother, nature, and home are all strong themes in Emily’s work, and all have earth connotations. Emily seems obsessed by the natural world around her: dismissive of God and often men, as Davies explained, she is rare amongst 19th century writers in treating even the dogs as characters in her novel. Davies compared Emily’s nature to Darwin’s (later) writings, which describe nature as an often beautiful but always destructive whole. “We forget that the birds which are idly singing around us mostly live on insects or seeds, and thus are constantly destroying life.” (On the Origin of Species). Emily, said Davies, sees the flow of the natural world, rather than a benign universe. Her nature has more in common with Tennyson’s, “Red in tooth and claw” than with a romantic idyll. Davies showed that for Emily nature is always both beautiful and destructive, just as the mother is always associated with death. Her earth is as much tomb as birthplace. These reactions, mostly contained in overall favourable reviews, can, said Riley, seem hard for us to understand. And they are not entirely explained by the fact that the words "hell", "damn" and "devil" were then by convention never fully spelt out in ‘respectable’ novels. The Brontës were not just licentious because they peppered their stories with these expletives. Their use of language was considered much more broadly improper. 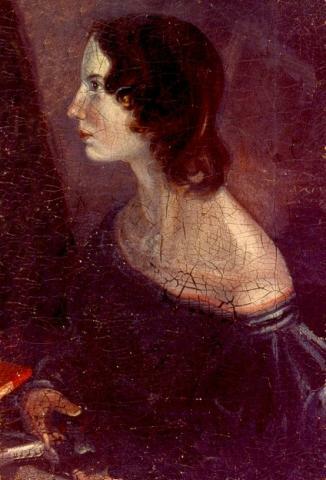 At a time when it was becoming increasingly common to use euphemisms for a wide range of “offensive” words (alcohol for a while became “peppermint”, said Riley), the Brontës dwelt openly on subjects like drunkenness and violence. Whilst a rule of silence was commonly used as a way to control people, in factories, prisons, schools or orphanages, the Brontë authors could easily be considered too free with their language. The problem went even further than the words used by Charlotte, Emily and Anne, said Riley, and becomes even harder to spot with a 21st century eye. We can perhaps imagine that Heathcliff’s violence, Rochester’s attempted bigamy or Arthur Huntingdon’s alcoholism were not recommended reading matter for the Victorian middle classes. We are less likely to spot that the use of Latin, or an interest in dialect or physiognomy, were considered equally improper for women. Indeed this goes some way to explaining why many critics refused to believe that the Brontës were women, even when they dropped the ambiguous pseudonyms Acton, Ellis and Currer.